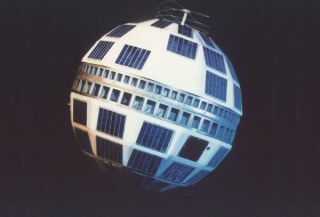 AT&T designed, built, and paid for the launches of the Telstar 1 and 11 with its own funds. The spacecraft were prototypes for a constellation of 50 medium orbit satellites that AT&T was working to put in place. ANDOVER, Maine (AP) _ Researchers whooped for joy when the era of live TV via satellite was born 40 years ago as Telstar orbited overhead, a scientist who was there said Thursday. Four decades ago, the first trans-Atlantic TV signal was relayed from a huge antenna in the woods of western Maine, beamed to Telstar I and relayed to Europe. The black-and-white image showed an American flag waving in front of the Andover Earth Station. Walter Brown, a retired scientist from Bell Labs, which created Telstar, was among the scientists, federal officials and dozens of reporters drawn to this former logging town of 700 people to mark the anniversary. A video teleconference re-enacting the broadcast was held in the town square at the anniversary observance, arranged by the International Institute of Electrical and Electronics Engineers. A plaque from all three Earth Station sites, in Andover; Pleumeur-Bodou, France; and Goonhilly, England, was dedicated. President Dwight Eisenhower had announced in 1960 that he had directed the National Aeronautics and Space Administration to take the lead in devising the use of space technology for commercial communications. The 171-pound (77-kilogram) Telstar, which was 34 inches (86 centimeters) in diameter, was launched into orbit from Cape Canaveral, Florida, on July 10, 1962. AT&T chose the remote western Maine town of Andover to build a ground station because it is surrounded by mountains and is far enough from microwave repeaters to avoid interference. The antenna that beamed the signal was enclosed in a huge bubble, 160 feet (48 meters) high. That same day, the first long-distance telephone call via satellite was carried by Telstar. During the call, then-Vice President Lyndon B. Johnson in Washington spoke to Fred Kappel, then chairman of AT&T, who was in Andover. The success of Telstar even inspired a hit record. The pop instrumental ''Telstar'' by the British group the Tornadoes reached No. 1 on the charts in both England and the United States. Telstar remained in operation only until February 1963, but the Andover Earth Station continues to operate. There are 260 active communications satellites today.